This side-by-side comparison shows both the difference between a polished finish (before) and a honed finish (after), and the difference between a poor quality countertop seam and an expertly repaired seam. Improper marble countertop installation can result in problems with edges, under mount sinks, caulking, and seam joints. This Manhattan countertop had a seam that had been cut and filled poorly. You can see in the BEFORE image the low quality, single color filler where the two segments of marble come together. First, we taped along both sides of the seam to protect the surface of the stone and covered the surrounding area, cabinet, and floor with plastic. 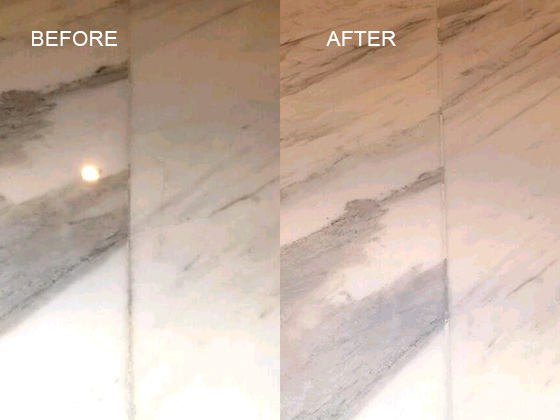 Then, we removed the existing fill and cleaned the edges of the marble thoroughly. We mixed high quality filler tinted with multiple colors to blend with the veining in the stone and inserted the material into the seam, removing any excess. Once the fill dried, we honed the seam, leaving it a smooth and uninterrupted surface. Our final step was to hone the rest of the countertop, to change the polished finish to a soft matte finish, per the homeowners’ request. They were very pleased with the results of our seam repair and refinishing. To learn more about our marble services, visit our Marble and Limestone Services page or watch this video.